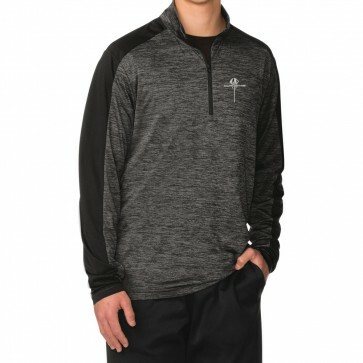 This lightweight pullover wicks moisture and resists snags. Finely detailed gray and black horizontal striping set against deep black colorblocked shoulders and sleeves. Cadet collar, open cuffs and hem. C7 Corvette signature and vertical Stringray logo embroidered on left chest. 100% polyester yarn-dyed jersey. Imported.